There were several standout performances at Canterbury Park over our July 20-22 PIFT weekend. Coming in at “1A,” is Tracy Stearman. Had we done a “PIFT player of the series,” the award would’ve likely been hers. 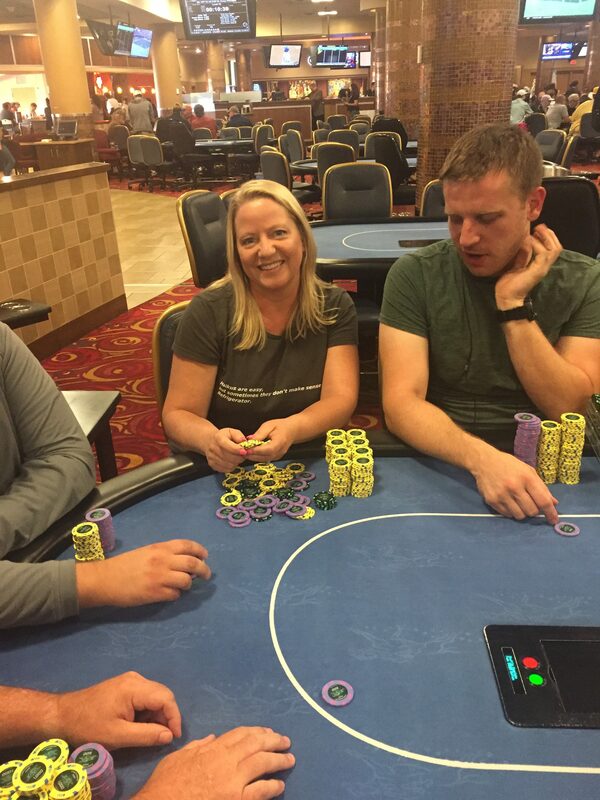 She took 6th place out of 129 entrants on July 21st in our $250 NLHE “Winners Shown,” which paid $1,443 in the 6th place slot, and then followed it up a day later with a 2nd place finish in our $100 NL “Crazy Pineapple” that had a field size of 117 players. The 2nd place slot that day had a payout of $1,209. She’s also the only player in PIFT history to have notched two final tables! Not to be outdone at “1B” was Ben Rock. 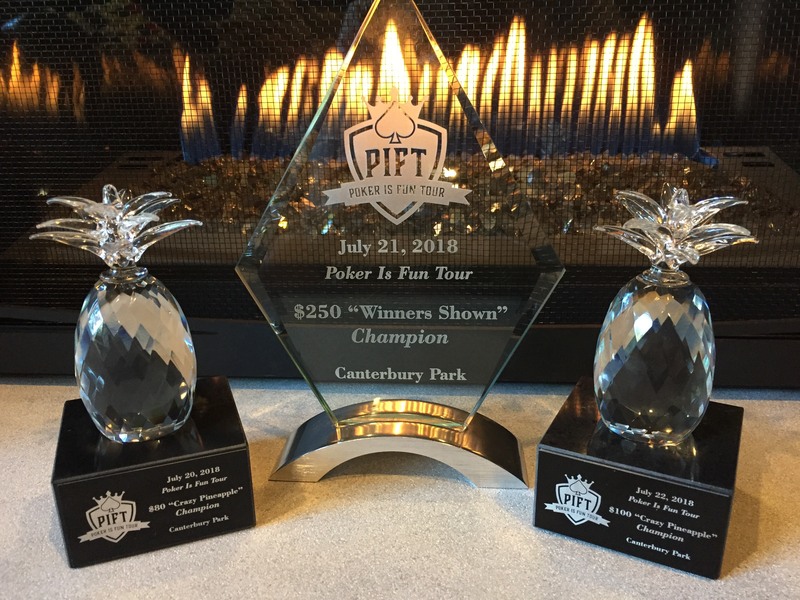 Arguably an equally impressive PIFT series for him, he got off to a strong start with a 14th in July 21st’s $250 NLHE “Winners Shown,” and followed up his cash with a 1st place victory, beating Stearman for the $100 NL “Crazy Pineapple” title and highly coveted PIFT pineapple trophy. You probably couldn’t go wrong arguing either of them would be worthy of a “PIFT player of the series title,” so let’s call it personal preference whether a 2nd and 6th or 14th and 1st is more worthy. Well done to both of Tracy Stearman and Ben Rock! Steve Shanks: He went into Sunday, July 22 with a shot at being 3-3, and came real close to doing so — but alas, him and his weekend had to settle for 21st of 215 on July 20th’s $80 NL “Crazy Pineapple,” and 3rd of 115 in the $250 NLHE “Winners Shown.” The combined, pre chop payouts for those two totaled $2,816. Scotti Kunkel: One of the few, and perhaps only player to have played in 100% of PIFT’s offerings both 2017 and 2018 (including 3 satellites), Scotti had a strong showing this year. He finished 12th in the $250 NLHE “Winners Shown” and 4th of 117 in the $100 NL “Crazy Pineapple.” Including last year’s cash he had, he is one of two players in PIFT history to have amassed 3 cashes. Kevin Kelly: Our second player to have 3 lifetime cashes, Kevin Kelly started off this year strong with a 4th in the $80 NL “Crazy Pineapple,” then added another cash to his resume with an 18th in the $100 NL “Crazy Pineapple.” He is also one of two players who went 2-2 in Pineapple! Kelly Day: Another player who joined us all weekend long, Day scored two cashes. He finished 17th in our $80 NL “Crazy Pineapple,” and 11th in our $100 NL “Crazy Pineapple.” Apparently there’s something about having Kelly in your name and being a Crazy Pineapple dominator in Minnesota! 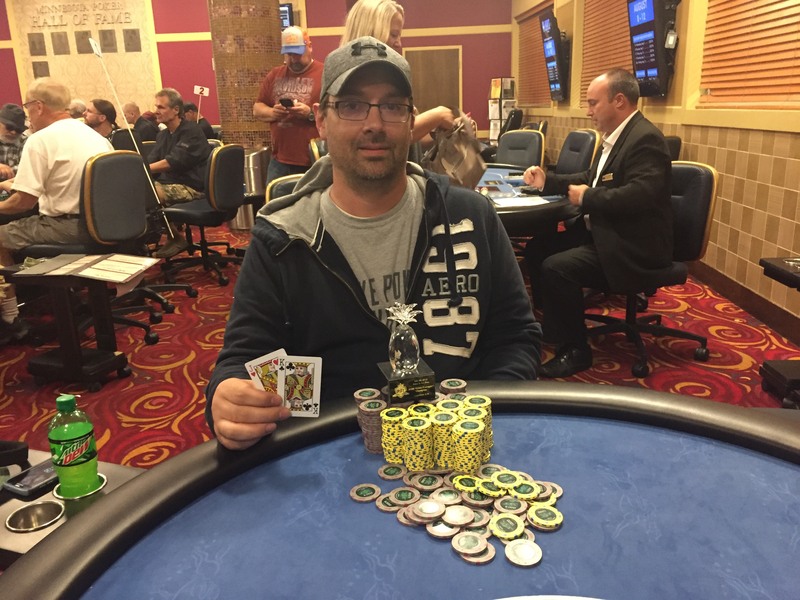 Scott Koernig, Friday July 20, 2018, $80 NL “Crazy Pineapple” champion ($2,053), beating a field of 215. 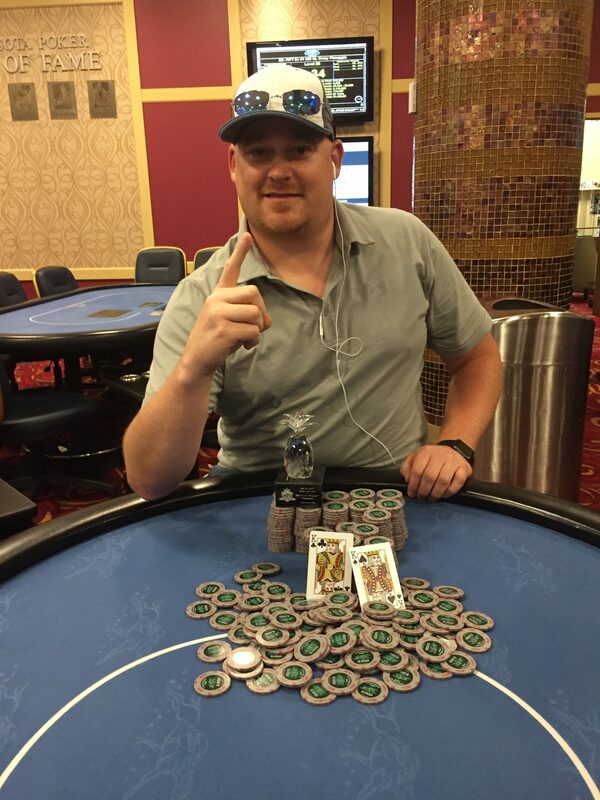 Trevor Hills, Saturday July 21, 2018 $250 NLHE “Winners Shown” champion ($5,111), beating a field of 129. 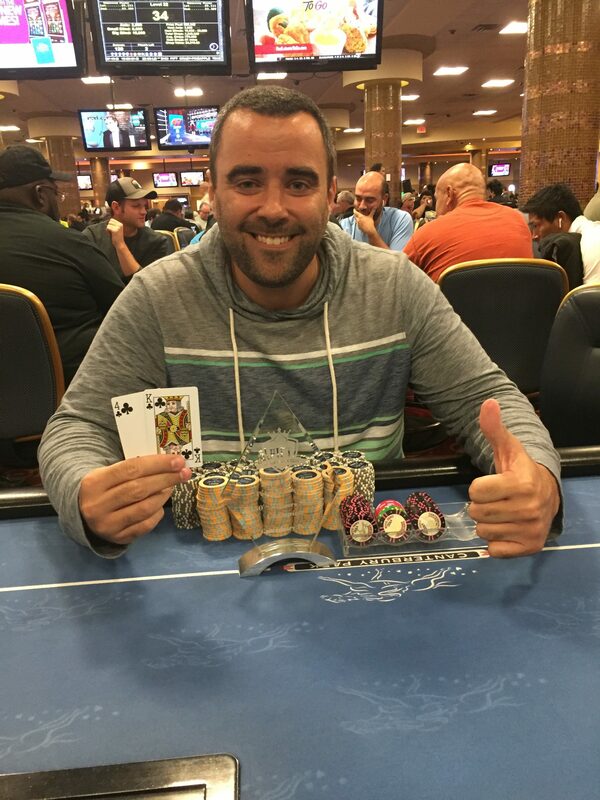 Ben Rock, Sunday July 22, 2018, $100 NL “Crazy Pineapple” champion ($1,843), beating a field of 117.